Garment bust sizes from 28 1/2 to 49 3/4"
Note that yarn used in sample is a sport/DK weight; some sport weight yarns may also work for this pullover. Worked in the round from the top down, this pullover owes its body-skimming fit to the resilience of the lace cable rib and to the drape of the yarn; there is no waist or sleeve shaping, making it easy to change the body and sleeve lengths to suit your preferences. There are no seams (sleeves are also worked in the round) and no finishing other than the attached I-cord neckband. The stitch pattern is quite stretchy and can be comfortably worn with slight negative ease, without the fabric being clingy. 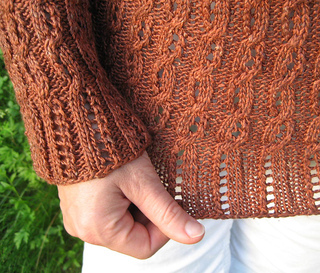 The openwork portions of the lace are relatively small, which means that wearing a tank or camisole underneath is optional (all photos show the sweater worn without an underlayer). The size of the neck opening can be adjusted somewhat to your preference, by adjusting the tension of the attached I-cord edging. 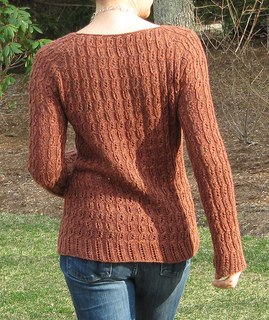 In addition, the sweater may be worn with the scooped neckline in back; the front may also be worked the same as the back, which will result in a modified boat neckline. 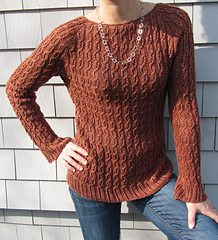 Intermediate: skills used include simple lace knitting and cables, reading a simple chart, increasing, casting on using knit-on method, picking up sts for neckband, and working attached I-cord. Yarn Sport/DK weight: 1090 (1250, 1370, 1550, 1660, 1790, 1930) yds; 1000 (1140, 1260, 1410, 1520, 1640, 1760) m. Shown in Tilli Tomas Fil de la Mer, 75% silk, 25% seacell, 140 yds /50 g skein, color #297 Burnt Orange, 8 (9, 10, 11, 12, 13, 14) skeins. These yarns all contain silk, linen or bamboo, fibers which generally add drape to the knit fabric. I have swatched with all of them to make sure the proper gauge can be achieved. When substituting yarn, it is especially important to knit a good-sized gauge swatch and measure it after blocking. Classic Elite Allegoro, 70% cotton, 30% linen, 152 yds/50 g skein, using US size 5/3.75 mm needles. 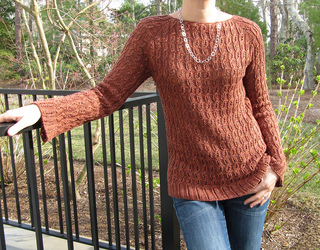 Debbie Bliss Prima, 80% bamboo, 20% merino wool, 100m/50 g skein, using US size 4/3.5 mm needles. Frog Tree Picoboo, 60% pima cotton, 40% bamboo, 116 yds/50 g skein, using US size 5/3.75 mm needles. Mirasol Nuna, 40% merino wool, 40% silk, 20% bamboo, 191 yds/50 g skein, using US size 5/3.75mm needles. Misti Alpaca Tonos Pima Silk, 83% pima cotton, 17% silk, 327 yds/100g skein, using US size 5/3.75 mm needles. US size 6/4 mm circular needle, 24-47” depending on selected garment size. 27 sts/33 rows to 4”/10 cm in patt st, with rib slightly relaxed. 23 sts/30 rows to 4”/10 cm in stockinette st.
Measure gauge on blocked swatch. Shown in size 32”, modeled with one inch negative ease at bust.